New Art and Designs by TET. Back in the late nineteen eighties I was creating a very different kind of skateboard art that tended to feature skulls and skeletons quite a lot. No doubt my art was inspired by Bones Brigade graphics of the time it still had a unique look that didn't really borrow much from Powell Peralta graphics. In my latest video (below) I look back at some skeleton graphics I drew about thirty years ago, some of which I'd still be happy if I had drawn those images today. I was also inspired to create a new skull demon skater graphic which you can watch me draw as I talk about my old art. 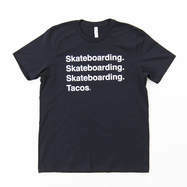 When it came to adding text to the graphic I was inspired by a Revive, Shredquarters T-Shirt that lists 'Skateboarding' three times and then finishes the list with 'Tacos'. 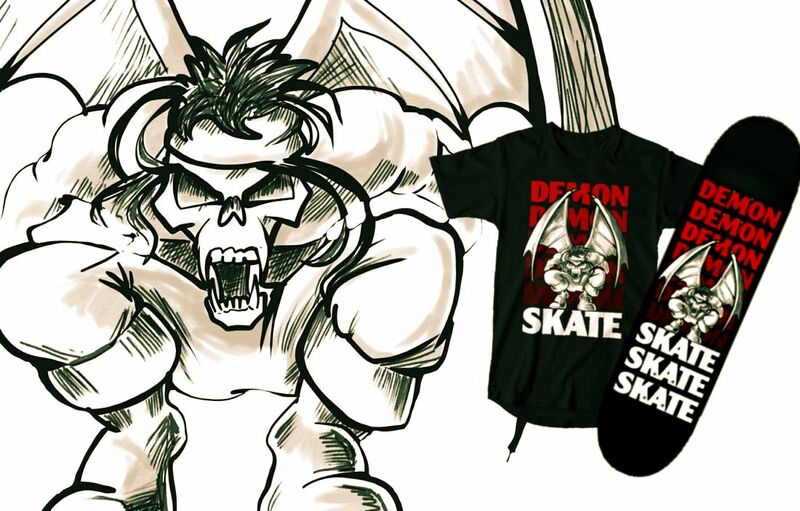 To my mind, in my design, I'm thinking, what if you were confronted by a demon whilst skating? Your mind could be momentarily distracted and then remembers skating... or it could be you might be remembering to skate the hell out of there, 'cause that's a demon! If you like the new design enough to want to own it, you can buy it on various shaped skateboards here. If you prefer your designs on clothing, stickers, journals, and other merch go here. There's also an exclusive double print hoodie on my Amazon Store.